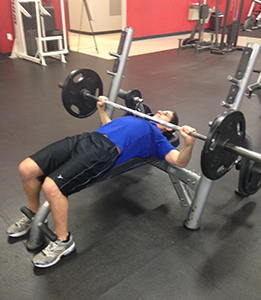 This article discusses the traditional barbell bench press from a fitness perspective. It does not discuss the bench press as it relates to performance such as competing in powerlifting. 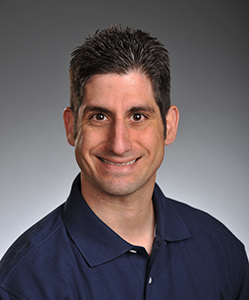 Rather, the purpose of this article is to provide an overview of the movement requirements and recommendations for the average fitness enthusiast to maximize safety and performance. Comprehend the movement requirements, joint actions, and involved musculature of the bench press exercise. Describe the "sticking point" and why it occurs. Provide recommendations for beginning fitness enthusiasts wishing to perform the bench press exercise. The bench press is one of the most popular exercises in the fitness and sports community and is often used as a measuring stick for evaluating upper body strength (Robbins 2012; Bianco, Paoli & Palma 2014). There is ample evidence describing its use for improving upper body muscular endurance, strength, hypertrophy (muscle size) and power (Buitrago et al., 2013; Ogasawara et al., 2012; Schoenfeld et al., 2014). There are some variations of the bench press exercise including the close-grip bench press, wide-grip bench press, incline bench press, decline bench press, dumbbell chest press, and reverse-grip bench press. For the sake of this article we will discuss the traditional barbell bench press from a fitness perspective. Table 1 provides a list of involved musculature. This is not an all-inclusive list as the nervous system activates muscles in groups rather than in isolation. Many muscles are involved in the joint actions listed above. It is also important to note that muscle activation varies depending if the muscle is performing an eccentric muscle action or a concentric muscle contraction, as well as the technique selected by the lifter (i.e., wide grip versus narrow grip). Lie on a bench with your feet flat on the floor. Maintain a 5-point contact position in which the following body parts remain in contact with the bench or floor: (1) back of head, (2) shoulder blades/upper thoracic region, (3) gluteals, (4) left foot, and (5) right foot. Some individuals shorter in stature may not be able to place their feet flat on the floor. In this case, use an elevated surface such as weight plates or short steps as foot rests near the end of the bench. Drawing-in and abdominal bracing activates the inner unit (transverse abdominis, multifidus, pelvic floor- muscles close to the spine) and global abdominal muscles (rectus abdominis, external obliques) offering greater spinal stability. Grasp the barbell with an opposing thumb grip (thumbs wraps around the bar) with your hands shoulder-width or slightly wider than shoulder-width apart. An opposing thumb grip provides more security and control of the barbell. Grasp the bar with the wrists positioned directly under the bar. This position helps avoid hyperextension of the wrists. Retract your shoulder blades (scapulae), bringing them closer together. Lower the barbell toward your chest, by flexing your elbows while maintaining scapulae retraction. Lower the barbell until a slight stretch is felt in the pectorals. Avoid letting the low-back arch, the head to jut forward, or the shoulders to shrug during this motion in order to maintain an ideal and safe posture. Preserve the natural curvature of the lumbar spine (low-back) throughout the entire lift. In other words, keep the spine in a neutral position. Elite powerlifters may perform the lift with excessive lumbar extension (arched low-back), but this position is not advised for the general fitness enthusiast unless properly instructed, and the person has a specific goal to increase 1 repetition maximum performance. Aim to perform the exercise through a full range of motion unless mobility/flexibility deficits restrict motion or pain/pinching sensations are felt in the shoulder region. Press the barbell back up to the starting position by extending the elbows and contracting the chest. Inhale during the lowering (eccentric) phase of the exercise. Exhale during the lifting (concentric) phase. 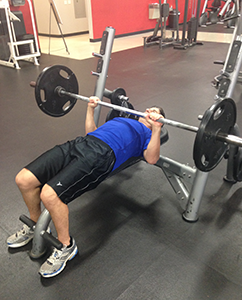 Elite athletes or powerlifters may perform the Valsalva maneuver during the bench press. The Valsalva maneuver requires a bearing down technique in which a person exhales through a closed glottis (airway). It’s a technique used to increase intraabdominal pressure and may enable a person to lift heavier loads. To visualize the Valsalva maneuver; it is most commonly performed in everyday life during a forceful bowel movement. However, this technique is not advised for anyone who is new to exercise or has high blood pressure. It also increases the risk for dizziness and loss of balance. There are variations in elbow position an individual can use when performing the barbell bench press. Some people preach a position in which the upper arms and elbows “flare out” away from the torso. Other experts recommend a position in which the elbows are close to the body, especially for those who have a history of shoulder pain or injury. It has been shown in the literature that performing the bench press with the elbows flared out to the sides and/or using a wide grip is best for activating the pectoralis muscles, particularly the sternoclavicular portion of the pectoralis major, the largest portion of the chest (Lehman, 2015). (Figure 2). However, this position may place the shoulder in a vulnerable position (Green, 2007). This may be especially true if an individual displays tightness of the pectoralis muscles, limited range of motion when assessing shoulder horizontal abduction, or a history of shoulder impingement. If a person has a history of shoulder impairment or displays limited range of motion through the upper extremities, it will be best to perform the bench press exercise with relatively light loads with an elbow-in position, or avoid altogether until shoulder stability and mobility impairments are corrected (Fees et al., 1998). This may take the form of performing stretching techniques for the pectorals, deltoids, and latissimus dorsi and strengthening techniques for the rotator cuff and scapulae retractors (rhomboids, mid/lower trapezius). In contrast, a position with the elbows closer to the torso and/or using a slightly narrower grip places a greater emphasis on the anterior deltoids, clavicular head of the pectoralis major (upper chest region), and triceps brachii, and less activation of the sternoclavicular portion of the pectoralis major (Lehman, 2005; Clemens & Aaron, 1997) (Figure 3). In addition, this position may be less aggravating for people with a history of shoulder pain because the eccentric phase requires less shoulder horizontal abduction and places a greater emphasis on sagittal plane shoulder extension. However, it is important to note, this position limits the amount of load a person can lift. In other words, an individual will have to use a lighter weight because this motion limits activation of the powerful sternoclavicular portion of the pectoralis muscle. Instead emphasis is placed on the smaller muscles (triceps brachii, anterior deltoid, upper chest) and as a result may not be ideal to develop maximal strength or muscular size. Scapular retraction during the bench press is important to maximize safety and performance. This position creates a stable base of support against the bench for the shoulders, decreases anterior forces through the shoulder complex particularly during the eccentric phase, and may improve activation of the pectoralis muscles (Duffey, 2008; Bench Press Analysis). Many argue this is the safest position for the shoulder complex, especially during heavy lifts because it provides added stability for the shoulders. When performing a bench press with a retracted scapula, some argue the pectoralis muscles enter the stretch reflex position sooner during the eccentric phase. By harnessing the stretch reflex, individuals will be able to maximize muscle recruitment during the concentric phase of the lift and subsequently the ability to lift heavier loads. To visualize the stretch reflex, imagine stretching a rubber band and then immediately letting go. The stretching of the rubber band creates a storage of potential energy, and upon release the rubber band flies through the air. The body’s muscles and tendons work in the same fashion. Scapular retraction also limits protraction and anterior tilting of scapulae (rounding the shoulders forward) during the exercise (Duffey, 2008). Stretch Reflex: The process in which a lengthening of a muscle is immediately followed by a rapid shortening of a muscle, creating a release of stored energy. The sticking point occurs shortly after the initiation of the concentric phase of the lift, typically when the bar is 3-16 cm from the chest (Van den Tilaar & Ettema, 2013). The sticking point is not the same location for everyone yet researchers have concluded it usually takes place about 0.2 seconds after the initial upward movement, and lasts about 0.9 seconds (Van den Tilaar & Ettema, 2013). Some researchers found the reason for the sticking point may be a loss of elastic energy from the stretch reflex discussed previously (Elliot, Wilson & Kerr, 1989). Because the elastic assistance of the stretch reflex ends very quickly, it creates added burden for the prime movers to move the weight. However, some researchers identified that muscle activity significantly changes during the sticking region when compared to the pre-sticking and post-sticking periods. This may be due to a mechanical disadvantage because the elbows tend to move more laterally through the sticking point (Gomo & Van den Tilaar, 2015). For those new to exercise it is important to take a slow and progressive approach to the bench press. Start with relatively light loads and focus on optimizing technique. Learning how to retract the scapulae, contract the abdominals, proper breathing, and controlling the path of the bar is a lot to learn in the initial stages. These techniques should be the focus before adding additional weight or focusing on maximal lifts. Start with a standard grip of the bar approximately shoulder-width and the upper arms abducted about 45°, and avoid an excessively wide or narrow grip. As confidence grows, fitness enthusiasts can begin to explore a variety of grip positions. However, anyone who experiences shoulder pain should avoid a flared-out elbow position until properly rehabilitated or receives clearance from a medical professional. Beginning fitness enthusiasts can also perform variations of the bench press using the techniques previously discussed. 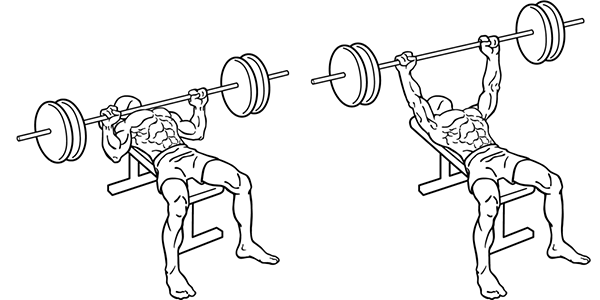 Exercises such as the incline bench press and dumbbell chest press use similar movement patterns. Performing these exercises (with a light load) may improve motor learning and quicken the time it takes to learn proper technique. It is important to note, beginners do not need to perform an abundant amount of sets or repetitions. Keep the volume relatively low to avoid overtraining and unnecessary muscle soreness. Lastly, it recommended for all individuals to use a spotter during the exercise. Bench Press Analysis. (n.d.). Retrieved September 18, 2015, from http://www.exrx.net/Kinesiology/BenchPress.html. Clemons, J., & Aaron, C. (1997). Effect of Grip Width on the Myoelectric Activity of the Prime Movers in the Bench Press. Journal of Strength and Conditioning Research, 11(2), 82-87. Duffey, M. (2008). A Biomechanical Analysis of the Bench Press. A Dissertation in Kinesiology, Pennsylvania State University. 91. Retrieved September 18, 2015, from https://etda.libraries.psu.edu/paper/8894/4230. Elliott, B., Wilson, G., & Kerr, G. (1989). A biomechanical analysis of the sticking region in the bench press. Medicine & Science in Sports & Exercise, 21(4), 450-462. Fees, M., Decker T., Snyder-Mackler, L., Axe ,MJ. (1998) Upper extremity weight-training modifications for the injured athlete. A clinical perspective. American Journal of Sports Medicine. Sep-Oct;26(5):732-42. Gomo, O., & Tillaar, R. (2015). The effects of grip width on sticking region in bench press. Journal of Sports Science, 8:1-7. Green, CM, Comfort, P. (2007). The Affect of Grip Width on Bench Press Performance and Risk of Injury. Strength and Conditioning Journal, 29(5): 10-14. Lehman, G. (2005). The Influence of Grip Width and Forearm Pronation/Supination on Upper-Body Myoelectric Activity During the Flat Bench Press. Journal of Strength and Conditioning Research, 19(3), 587-591. Tillaar, R., & Ettema, G. (2013). A Comparison of Muscle Activity in Concentric and Counter Movement Maximum Bench Press. Journal of Human Kinetics, 8(38), 63-71.